We have much to boast about. For starters, the Tampa and St. Petersburg area is a true boater’s paradise offering unlimited opportunities for exploring sheltered bay waters or venturing out into the Gulf of Mexico. extreme heat discomfort, sun glare obscuring views, and the potential of serious skin damage and fading of interior fixtures caused by UV rays. Acclaimed yacht dealers and boat owners in areas surrounding Tampa/St. Pete, Sarasota, Naples, and Fort Lauderdale, continue to call our team to eliminate these issues. Why us? Because we apply the industry’s most elite marine window film and have the expertise to install it with precision on any boat, any size, anywhere in Florida. We recently filmed nano ceramic on this spectacular Viking! With its 100% dye-free and metal free technology, the Viking’s glass will never succumb to discoloration, fading, or demetallisation. Speaking of glass, at the end of the film installation, we gave the Viking’s windows our special glass treatment for long lasting protection and beauty. This application, made to withstand a salt-water environment, repels water build-up and preserves the integrity of your vessel’s windows. Definitely something we encourage every boat owner to have. Call to schedule a complimentary window film demonstration on your boat and discover how you can take your boating pleasure to the next level! Unlike glass areas in a stationary building, boats introduce architectural challenges. There’s window tinting…and then there’s “yacht” window tinting. It takes the strategy and skill of true craftsmen to execute precise window film installations on marine vessels. Much like specialists who strive to be the exception in any professional field, our vast experience and training prepares us to be exactly that – specialists for yacht owners who won’t settle for anything less than excellence! 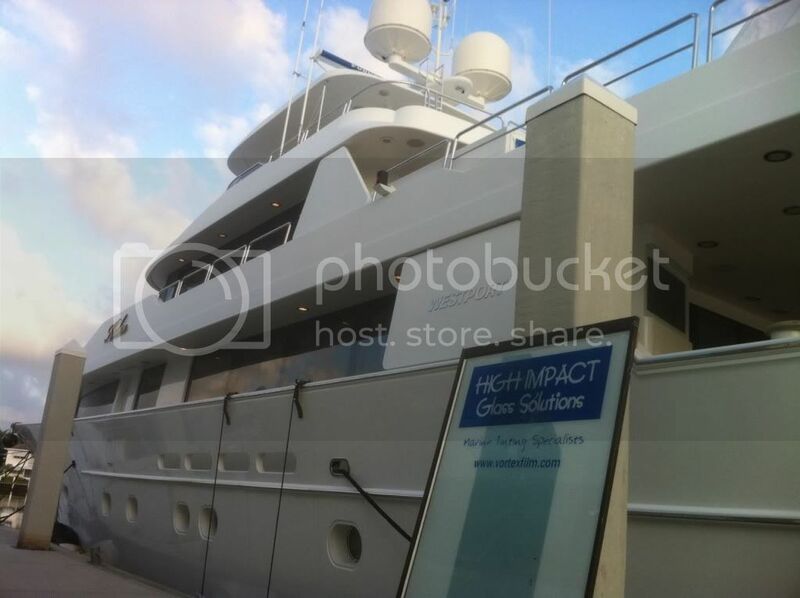 High Impact Glass Solutions performs an analytic evaluation of your boat’s glass. The formula for success must start with a strategy based on what your particular boat needs for optimal results. We then demonstrate the performance of the recommended films on your glass. You can only imagine how delighted this captain was as he noticed the visible difference the film made on the left and right panes of glass. When the installation was complete, he could instantly FEEL the difference as well! Boaters no longer have to compromise their boating pleasure with discomforting heat, views obscured by glare, the sun’s damaging rays on skin, UV rays fading luxurious interiors or interference with navigational systems. Our selection of films are comprised of the industry’s most elite, non-metallic ceramic window films specifically designed for harsh marine environments and come with manufacturer warranties. We believe that every yacht owner deserves to enjoy their boating experiences with ultimate pleasure and safety. Before you cast off, chart your course with a phone call to our marine film specialists.